How to Select Impact Metrics for Your Investors? Support-Oriented Investor who seek to strengthen the capacity of community organizations in a specific city or around specific issue areas. It is important to identify what kind of Vision-driven approach your organization takes. Overall think of it like this, your Vision shapes your Outcomes and your Outcomes drive your metrics. So, if your Vision is to have a specific outcome on society that involves a focus area, you may have a set grouping of impact metrics to monitor the progress toward your grand Vision. That’s reasonable. You have goals to hit along the way, and the organizations you fund are strategically selecting to keep you on track for hitting your goals. In that case, driving the metrics selection process makes sense. This still holds true if you have multiple focus areas all with specific outcomes your organization is working toward. If your Vision is more oriented around capacity building for organizations that rest within a designated place or focus area, your outcomes should reflect this. 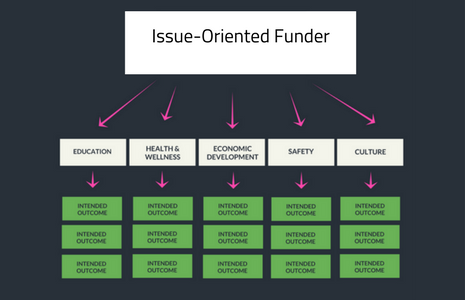 As a funder, you have several programs of your own that don’t necessarily include ‘Education, Health, Safety, etc.,’ but instead cover HOW you support the issue areas you care about. This might include ‘Seed Funding’ ‘Operational Capacity Building’ ‘Grant Funding’ and so on. If your focus areas are relatively stationary, consider adding one or two metrics for each. Actionable Impact Management (AIM) is a framework that guides readers through each of these three steps as well as how to communicate or share your impact findings. It is free and a good place to start for anyone wondering how to go about selecting enduring metrics around their impact hypothesis.